Premium foam board is available in 25 sheet cartons. Sorry, no Shipping on broken cartons. 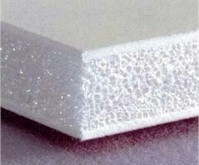 Foam board is available in white foam with white paper. These are laminated to form the board. and the specially formulated flame resistant facers meet TAPPI T4610M-94 standards. Label stating fire rating comes in each ctn.